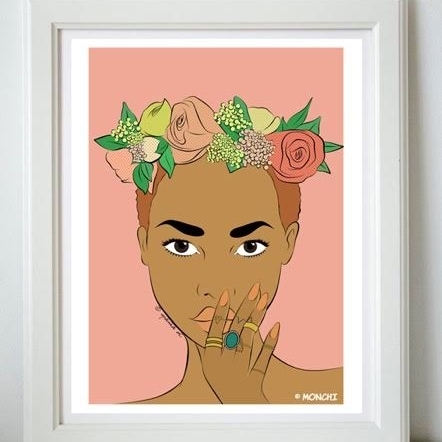 Pop artist Nyanza D uses traditional sketches as a base for her vibrant pop art pieces in many of which she strives to reflect modern black female identity. Nyanza, as with many Pop Artists before her, takes her inspiration from popular culture such as comics and computer games to evolve her bold and contemporary style. "I am a full-time artist who works from home! One day I’d like to have a studio. My family is quite creative - my Mum, brother and sister write while I was always ‘the artist’. Although I studied art in secondary school I’d still like to say that I’m self taught as I didn’t go to university for any ‘formal’ training. I feel that in school, the way they teach art is very restrictive and it kills your imagination. They teach what’s on the curriculum only for you to get a grade based on what they want to see. I don’t agree with it at all. Art to me is all about freedom. Because of that, after I left school, I became scared to create my own characters and instead I re-drew existing images until I became inspired and comfortable with drawing my own stuff again. I then got re-connected with the Archie Comics that I had when i was little and I remember always being drawn to that style. I googled all these 50s pop artists and vintage comics and started to teach myself their style but with my own twist. Almost four years later, I’m still learning about my craft and seeing new things that inspire me daily." And what about the artwork? "I’d been drawing for as long as I can remember but it took a while for me to find my pop art style. I’d describe my work as ‘modern pop art’ with both vintage and contemporary muses. My artistic style is influenced by a lot of artists, but I make it unique with my own subjects and existing ideas. Roy Lichtenstein and Bob Montana are key comic artists that I get my influence from. Consistent themes of my work are femininity, freedom and identity. I want to show a range of personalities, and I think the beauty of pop art is that it adds dramatisation to everything. The characters are an extension of my desired mental and/or physical space. My earlier works really showed the kind of style I wanted to have growing up - coloured hair, piercings, nails, tattoos etc. To me, having that freedom to express yourself however you wanted in this world was and still is quite revolutionary to me." "Many things. I watched a lot of TV, film and music videos and played a lot of games as a child and certain things stuck with me. My images are based on women I saw or wanted to be like growing up. I’d see a woman on TV with a specific 'je ne se quoi' demeanour about her and I’d be like, ‘oh my gosh... I love her. I wanna dress like that in the future!’ I’m even like that when I see everyday people on the street or on the internet sometimes. It’s like a ‘I know it when I see it’ thing when it comes to muses. I think that’s part of the reason I really used to love games like The Sims, WWE, Mortal Kombat… there was such a broad range of characters but you can create your own as well." Let's finish with an interesting fact! "I always say that I want my pieces to stand the test of time, whilst showing future generations what culture looked like at the time. For example, people know that 1950s pop art was a reflection of the post-war white suburban American lifestyle. Brands were on the rise more than ever, and the art around that time helped it thrive greatly. (see - Warhol’s ‘Campbell’s Soup’). I hope people see my images as a reflection of black female identity and the perception of women amongst other things in many years to come."